CEO of Valor Janitorial Services, Brandon Hayes recently shared an encouraging outlook for 2014 in an email. 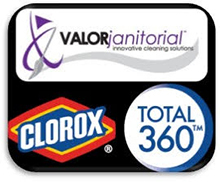 He says that "It's never too late to make a brand new resolution" and also emphasized to customers one of Valor Janitorial's most important qualities, --Customer Service. 2014 is here at last, having sent 2013 packing for good. But don't linger too long in fond remembrance of days gone past. With each new year comes a new beginning - a clean slate on which you can write a new chapter of your life! Sounds pretty good, doesn't it? We think so, too. To get a jump on the new year, now's the time to bear down on those pesky resolutions you made that you're probably considering giving up, if you haven't done so already. If this sounds like you, cheer up. It's never too late to make a brand new resolution. If you need help doing so, we’ve got a great idea you’ll probably love. Why not resolve to keep a cleaner facility? It's realistic, it's achievable, and we can help you make it happen. At Valor Janitorial, we offer an array of services that will ensure this particular resolution sticks for good. Customer service that will leave you slack jawed with amazement. That last bit wasn’t a brag. It’s truth! And the best part about all of this is that we are a locally owned and operated company. Which means that when you pick up the phone to give us a ring, you’ll be talking to a fellow community member who understands your needs implicitly and will stop at nothing to ensure your complete satisfaction. So why not call us now? You’ve probably got questions about our services. We’ve definitely got answers. Give us a ring anytime at 214.703.8060 to arrange to get a free estimate. Or, if you prefer, simply fill out our online contact form and we’ll be in touch shortly. From all of us at Valor Janitorial, we sincerely wish you a wonderful 2014 filled with joy, prosperity and a sparkling clean facility!